Published on 11 February 2015. Today, RDM Group have unveiled the Lutz Pathfinder, a prototype driverless car. This is to be the first driverless car tested on public roads in Britain, after legislation was passed a few months ago to allow their operation. Yet there are unresolved questions about the ethics underlying the algorithms which direct driverless cars; and, in particular, how they weigh the value of human life. Despite what other sources might say, these are not really new problems—but they are, nonetheless, interesting. In this post, I’ll draw on some historic examples of similar problems, and see if they help us to make sense of this 21st century quandary. Back in 1948, the Cold War between the Eastern Bloc and the Western Bloc was beginning to heat up… or cool down, depending on how you look at it. Either way, the US Air Force wanted the capacity to blow the Soviet Union to smithereens, should it come to that. So the US Air Force asked mathematician Edwin Paxson to use mathematical modelling to work out how best to co-ordinate a first nuclear strike. Paxson and his team set about their work, considering almost half a million configurations of bombs and bombers. They took into account dozens of variables including countermeasures that might be deployed, targets that could be selected, and routes the bombers should fly. In 1950, after months of work and billions of calculations, Paxson delivered his verdict in a now-famous report called Strategic Bombing Systems Analysis. His solution: fly a nuclear device to Russia in a cheap propeller plane, surrounded by a large number of similar decoy planes. The huge swarm would overwhelm Russia’s defensive capabilities and, although planes would be lost, the likelihood that the armed plane would be destroyed would be exceptionally low. One of his team described the strategy as “filling the Russian skies with empty bombers of only minor usefulness”. The response to this recommendation was not positive: Paxson was vilified. The Air Force responded with a combination of bewilderment and indignation: how could Paxson possibly suggest sending Air Crews on a suicide mission in cheap rickety planes? After all, war surely meant doing everything possible to protect allied servicemen while killing enemy servicemen—preferably using the leanest and meanest cutting-edge technology available. But Paxson was vilified not because he gave the wrong answer: rather, he gave the right answer to the wrong question. His method was the way to cause the greatest amount of damage to the enemy for the lowest system cost—but it didn’t consider the value of human life. Or, rather, it didn’t consider the value of the lives of the American Air Crews. Nobody thought for a moment that it should consider the value of Soviet lives. Of course, had it considered all human life as equal, it seems hard to imagine how a nuclear strike could ever come to have been proposed at all. Why is a Kundunese life worth less to me than an American life? I don’t know, sir, but it is. This is a deeply philosophical question, but it’s also one that needs answering for practical purposes: without a value, we can’t make cost-effectiveness calculations to answer all sorts of important questions. The US Environmental Agency pegs the value of a life at about £6m. The airline industry uses a value of around £2m. The UK Department of Transport puts it around £1m. Most Western medical organisations, NICE included, price a year of life lived in full health at about £20-30,000. That’s a little tricksy, because—based on life expectancy—that means the UK value of a 20 year-old woman’s life is about £1.5m, versus about £1.1m for a 30 year-old man. It also means that a baby girl in East Dorset is worth about £360,000 more than a baby boy in Glasgow. And if you’ve a disability, your life is worth less than someone of equal life expectancy without a disability. Variation in the value of lives, whether by gender, age, or nationality feels inherently wrong… but is it actually wrong? Or is it the reality of the world we live in? Like much political legislation, this robotic law is well-intentioned but functionally useless in the situation we’re considering. You may already be familiar with the “trolley problem”: a runaway train is heading down tracks towards a group of five people. A woman is stood next to a lever. Pulling the lever will shift the points in the track and send the train barrelling instead towards a single person. Should the woman pull the lever? Some ethicists would say the woman should pull the lever: from a utilitarian viewpoint, she is obliged to reduce the number of people who come to harm. Others would say that the woman should not pull the lever: a deontological view might hold that the act of pulling the lever would make her complicit in the killing of another human being. Replace the woman with a robot, and the robot is forced to break Asimov’s First Law of Robotics no matter what action it takes (or doesn’t take). We’re effectively entrapping the robot. 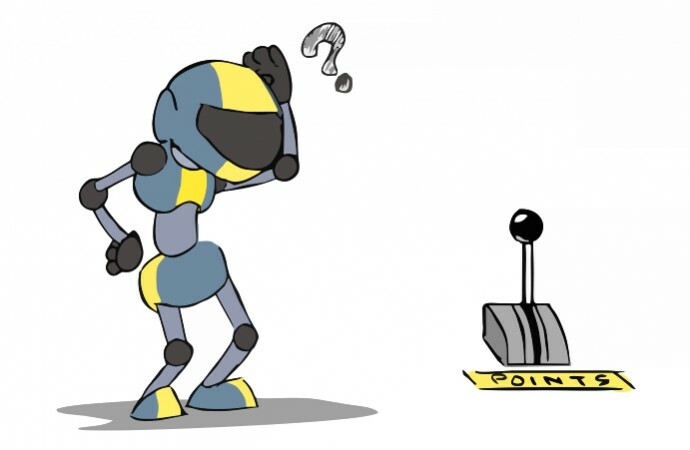 Perhaps it isn’t surprising that we haven’t “solved” an ethical problem for robots given that we haven’t “solved” it for humans. But that doesn’t mean that it isn’t a problem. In humans, we can rely on the free agency of the individual and judge them post hoc. Robots, at least for the time being, are not sentient. They do our bidding, and we must decide our bidding in advance. There is no ‘in the moment’ free agency to rely upon—we will know (or at least will be able to know) with certainty the action that will be taken in advance. So what are driverless cars to do? If a driverless car finds itself in a situation where it must choose between a high speed collision with a pedestrian or with a wall, which should it choose? From the point of view of the car, should the lives of the pedestrian and the car’s occupant be of equal value? Or should the car prioritise the life of the owner? And what if the individual pedestrian is replaced by a group of pedestrians? Or a group of children? It could be argued that the car should prioritise the lives of its driver, since that it what humans tend to do in practice. Or it could be argued that the car should value everyone equally, and protect the greatest possible number of lives possible, since that utilitarian view is how we might want humans to act. Or it could be argued that the risk should be borne entirely by the person choosing to operate the vehicle, and so the car should act to prioritise those outside of it. Some writers have suggested that driverless cars will be forced to prioritise the life of the driver due to market forces—no-one will buy a car which might decide to kill them. Yet, of course, there is also society and legislature to consider—and it seems unlikely that cars which did not give due weight to the life of pedestrians and others outside the car would ever gain societal acceptance. And so, driverless cars look like they’re stuck in an ethical rut: they can neither prioritise the life of the driver nor prioritise the life of the pedestrian. So what can it do in the “wall or pedestrian” situation? Choose randomly? That also seems… unethical. Much is written about the ethics of self-driving cars in these extreme situations, and they are interesting philosophical and ethical questions to ponder. But they aren’t particularly helpful in a practical sense. Much like Edwin Paxson, we being compelled to consider the wrong question. One of the flaws in the trolley problem is that humans are rarely in a situation with two clear, diametrically opposed options. We have a range of choices available to us, not just pulling or not pulling the lever that controls the points. Maybe we could shout a warning to the people in the path of the train; maybe we could signal to the driver to stop; maybe we somehow derail the train. And this is the first reason why the question is wrong: the car can take more than two actions. It can sound its horn; it can perform an emergency stop; it can can deploy an airbag; it can hand control back to a human. The dichotomous choice is unrealistic. In addition, the technology isn’t at the standard required to assess a situation in the detail the problem describes—and the programming in the car will probably never consider the situation. 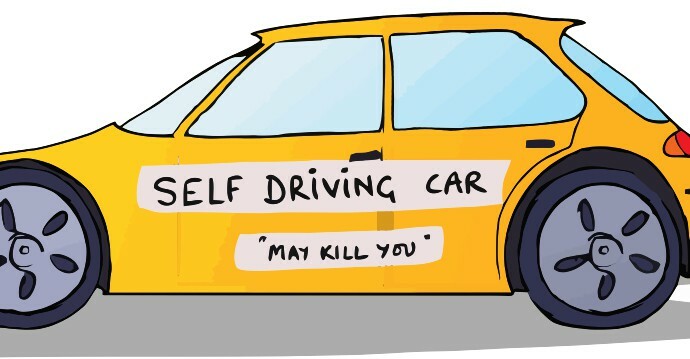 It is unlikely that any self-driving car will be programmed with a “crash self” option. It will have a number of reactions to stimuli, including “do not crash into pedestrians” and “do not crash into walls”, and will respond in the event of a conflict probably by avoiding the pedestrians rather than the wall: just like a human, it would not know at the decision point what the outcome would be for the human driver, but there would no doubt be advanced protective mechanisms in place just as in non-driverless cars. In fact, by allowing the car to crash in a predictable way, the safety of the occupants can probably be increased even in the event of a crash. Your washing machine at home is pretty much autonomous in operation. Does it prioritise preventing fire or preventing flood in the event of a malfunction? I have no idea what mine does, but I suspect that the situation is so far out of normal operating limits that it isn’t specifically programmed to do either. Perhaps the same is true of driverless cars. It’s also worth considering that this sort of problem isn’t as new as it appears. 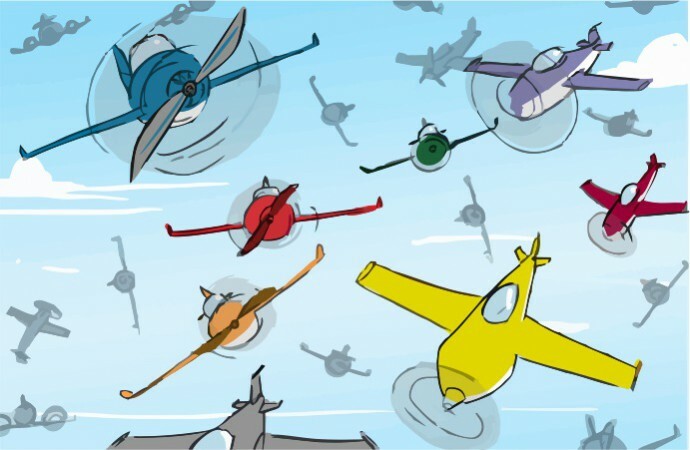 Cars are not the first autonomous vehicles: aeroplanes have used autopilot for decades. Self-parking cars have been around for years. Both of these hand control back to the driver when the situation becomes difficult; perhaps that will turn out to be the solution for driverless cars, too. I argue that we simply don’t need to worry too much about the ethics of driverless cars. They present an interesting philosophical discussion, but it isn’t a practical consideration at the moment, and nor will it be for a long time to come. By the time it does become an issue, incremental development which have occurred in the meantime will likely point us in the right direction. For now, I’m just looking forward to sitting back and enjoying the ride! Many thanks to Amrit Tigga for the wonderful cartoons he's drawn to illustrate this blog post. This 2,298th post was filed under: News and Comment, Driverless cars, Ethics.